Emotional intelligence has been generating interest since Daniel Goleman first released his book Emotional Intelligence: Why it can matter more than IQ, back in 1995. It is a concept that has gained more and more popularity in recent years and is now largely considered as far more important when predicting future work performance than IQ. Our emotions are thought to play a far greater role in thought, decision making and individual success than is commonly acknowledged. Even more importantly, emotional intelligence (EQ) is something that can be nurtured and strengthened in all of us. As a business psychologist, this is the part that interests me – how can we learn to improve our emotional management of situations to further maximise our potential in the workplace? Two of the pioneering researchers in the field of emotional intelligence define it as “the ability to monitor one’s own and other people’s emotions, to discriminate between different emotions and label them appropriately, and to use emotional information to guide thinking and behaviour” (Peter Salovey and John Mayer). Knowing one’s emotions – basically self-awareness, the ability to recognise a feeling as it is happening is the cornerstone of emotional intelligence. Managing emotions – being able to handle our feelings so that they are appropriate is an ability that builds on self-awareness. Motivating oneself – our ability to marshal our emotions, using self-control, to enable us to achieve our goals. Being able to get into a state of “flow” allows us to achieve outstanding performance. Recognising emotions in others – what is the social cost of being emotionally tone deaf? Fairly high I suspect. Empathy is the ability to identify the subtle social signals that indicate what others want and need. Handling relationships – the art of relationships depends largely on social competence. When people have “people skills” they can shape encounters, mobilise and inspire others and thrive in relationships. We all differ in our abilities in each of these five domains, but our brain is constantly adapting and learning from situations. For this reason, our emotional intelligence (EQ) differs from our cognitive intelligence (IQ). What is now widely known is that academic intelligence has little to do with emotional life. The brightest among us can be stunningly poor pilots of our private lives. Whereas IQ is largely genetically inherited, is pretty much set and tends to peak when a person reaches around 17 years of age, emotional intelligence is a whole different skill set that continues to be shaped and developed well into adult life, thought to peak in one’s forties and fifties. 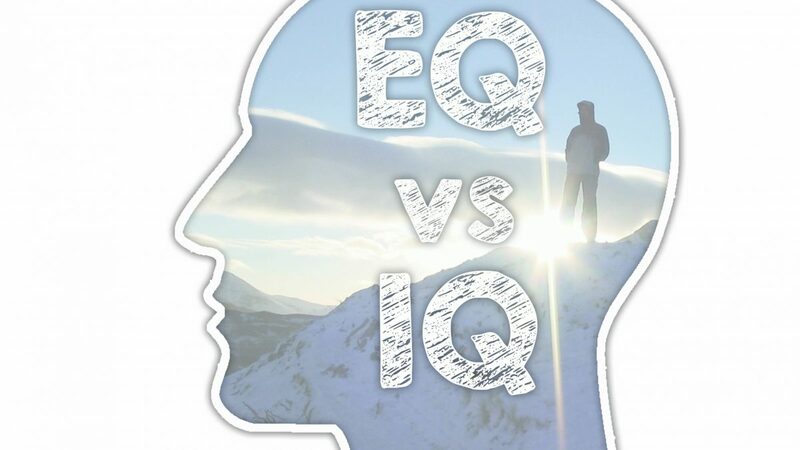 IQ and EQ are not opposing competencies, rather separate ones. IQ is thought to contribute towards about 20% to the factors that determine life success – this leaves a whopping 80% to be determined by other factors. A significant portion of this 80% will be accounted for by our emotionality. Emotional aptitude is a meta-ability determining how well we can use what skills we have, including our raw intellect (Goleman, 1995). Why do our emotions need to be intelligent? Whilst we now know that our emotional intelligence can be enhanced, to what extent does it actually matter if we are emotionally smart or dumb? Some of us are born more cognitively intelligent than others – and this type of intelligence might take us further and faster, in certain paths in life. But in most areas of life, even those of us who are sharp as a tack will not succeed if we can’t convey our emotions intelligently. Smart really can become dumb without a full appreciation of how you relate to others and how you control your emotions. Leaders who lack emotional intelligence are likely to fall prey to their own negative interpersonal tendencies which can act as career derailers. Goleman’s research found a direct relationship between the emotional intelligence of an organisation’s staff and the organisation’s success. Emotional intelligence is not only an area that we as individuals should be focusing on improving for our own wellbeing; but also as organisations – building teams of socially competent employees who can help create an upward trajectory for our businesses. To find out more about emotional intelligence and how Lakeland Capabilities can help you to measure and develop this for your people, check out our website or contact us for more details.